And we welcome the Autumn season with some inspired and delicious recipes made with apples, yes the #TwelveLoaves team, made a bunch of different types of bread and because is apple picking time, you can make all of them. My take this month on a delicious apple inspired bread is something the I love eating growing up, Braid Bread, the bakeries in my country have all kinds of braid bread, sweet or salty you just can’t decide in just one. I try this recipe a couple of times and is not your typical bread recipe, is more compact and doesn’t rise a lot. The most important here, is the you make the bread and enjoy with a cup of coffee or tea, because in the cool afternoons there is nothing better than that. Add the yeast to the warm milk and let it proof for about 5 minutes, you can sprinkle some sugar to help. In a bowl mix flour, eggs, vanilla extract, salt add the yeast (once ready) and mix to combine with a wooden spoon, add the butter little by little and mix until is all incorporate. In a slightly flour surface, place the dough and knead for a few minutes, place in the bowl aging and let it rest for 30 minutes. In the meant time place dulce de leche, cinnamon, salt and apples in a pot and cook for 5 minutes in low heat. Let it cool completely, this is important we don’t want a hot filling for out dough. Ok now the fun part, form a rectangle with the dough and place it in a baking sheet cover with parchment paper, add the filling in the center and cut the sides, about 10 each side, but from the center to the outside, is a little messy but thats ok, my little daughter help me with this one and it was super fun. See what I mean, when I have help everything looks so beautiful, ok then put the little pieces one on top of the others, remember to close the ends, you can brush some egg mix with little water to make it more brown and delicious. This recipe makes 1 braid bread. Our host this month is Heather from girlichef, and our theme is Apples. 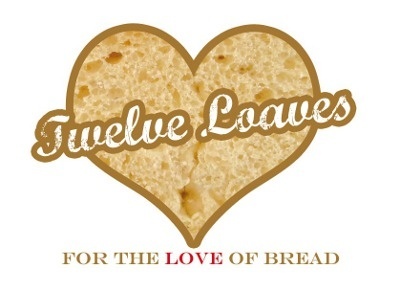 For more bread recipes, visit the #TwelveLoaves Pinterest board, or check out last month’s mouthwatering selection of #TwelveLoaves Pear Breads! Welcome to another recipe with the #BundtBakers family, this month ingredients is, well actually are many ingredients we can use this month for our recipe, like apples, pumpkin, pear, squash, anyway, all the autumn harvest. And you all know the I love baking with this kind of ingredients, they are great in flavor, texture and you can combine them to give a new level to your daily bundt recipe. I incorporate 2 of my favorites in one, apples and pumpkin, I just fell like I need it to say hello to Fall, and what better way to do it, the with this two ingredients. Perfectly mix together, and you will have a kind it flan-ish like bundt cake, you’ll see when you make it. Ok so, let me know as always is you like the recipe, share with you friends and family and of course, Enjoy. In a saucepan combine apples, pumpkin puree, cinnamon, brown sugar and nutmeg, cook for 3 minutes, one ready place the mixture in the bowl of the electric mixer and beat in low speed for 5 minutes, this help to cold down. Add buttermilk and oil, speed up a little and add eggs, vanilla extract, in a separate bowl sift flour, salt and baking powder, add to the mixture above and beat for only 3 more minutes, this is enough time for the mixture to get well combine. Pour into a prepared bundt pan and bake for 1 hour and 20 minutes of until the center of the cake is completely cook. Allow to cool and invert into a cooling rack. This recipe makes one bundt cake. Now get even more inspired with this incredible recipes.